Dog breeders allow animal rights groups, local officials, the press, even neighbors to project them in a negative public image. Instead of complaining on chat lists (only other breeders read them), why not identify where the pressures are coming from and collectively come up with a campaign to improve the image of dog breeders? Let me give you an example of a well-known group that turned their image around. 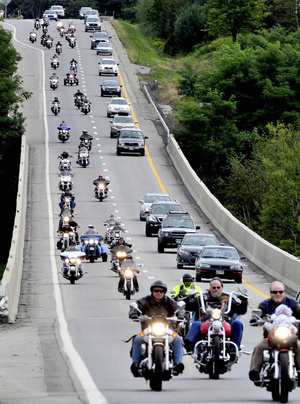 Not that long ago, a bunch of motorcyclists riding together evoked feelings of fear and hatred. No matter who they were or what kind of motorcycle they rode, they were identified as bikers and outlaw gangs. Cops harassed them and businesses barred their doors. Then collectively, bikers started to change their image. Of course it helped that many of the 'bikers' were doctors, lawyers, and other professionals but the public didn't know that until they began a campaign to change their image. Bikers invented Toys for Tots and became associated with numerous charity rides. Today, cities like Daytona Beach actively court 'bikers'. Businesses have signs up front saying "Bikers Welcome". Another group that's doing nothing to help their image. Jet ski sales keep growing every year, and so do laws limiting their use. The Jet ski industry and users do little to counter their image when there is much they could do. Manufacturers could make them quieter and riders could show common sense when riding close to shores and other boats. Breeders aren't yet viewed in the same light as the bikers were, but you can see it heading that way. The image people used to have of breeders as loving animal owners is fast deteriorating. The collective solutions I would leave to others with more knowledge than I, but there are many things that individuals can do. Charity goes a long way to warming people's hearts. A simple act of donating a puppy to child who has lost her parents in an accident, or someone undergoing chemotherapy, would work wonders for all involved. Take a couple of your well trained and socialized dogs to a senior center for an afternoon. They will thrive on the attention and the seniors will enjoy the pure and unbridled love dogs are happy to share. Do things to help your breeding kennel fit into your community. If you live in a populous area your neighbors would appreciate a sight/sound barrier. A hedge row along the property or around the kennel works wonders. It looks great, adds to the property values, and insulates your neighbors. If you have a barker, think about why he barks and find a solution. I am reminded of a news story I saw last week where a bunch of people were complaining about a local breeder. I didn't see the whole story, just caught the last of it. But right off the bat I wondered why it had become a big enough battle to make the evening news. Both sides think they are in the right, and the problem is they are both in the right. The breeder has the right to follow his chosen hobby/profession and the homeowners have a right to the quiet neighborhood they bought into. My thought was that there was a lot the breeder could do to fit in instead of fighting a battle he will ultimately lose. The image the press presented was pretty bad. I'm not a crusader. As a one-dog pet owner, this doesn't directly affect me. It's just that sometimes I see problems with obvious solutions that people too close to a problem can't seem to see. It's like looking into a mirror and seeing an image of the gorgeous gal or handsome man you used to be. There's a saying I like, "I can't control the way the wind blows but I can adjust my sails". So instead of kennel owners fighting laws and wasting time complaining to each other, they should expend just a part of that energy towards changing public perception. Do things that put the image of hobby breeders in a good light. 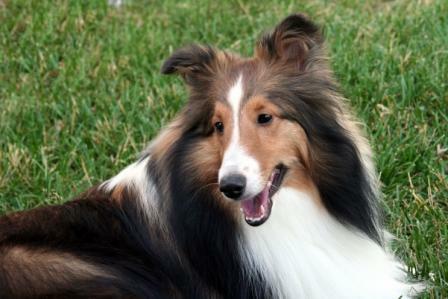 For instance, you know that your hard work and attention to detail keeps a Collie a Collie. You work to breed out inherited faults and diseases. But does the general public know that? Is that the image they see of you as a dog breeder? I constantly see PETA and ALF in the news. I am inundated with reports of dogs attacking small children and elderly women. I see homeowners suing kennel owners. I never, ever, see a report showing a dog breeder in a good light, or doing something for the community, or doing anything to improve the public's perception. So whose laws do you think will pass? How much are your few thousand votes going to count against the unsavory image of dog breeders painted by PETA? What really makes me crazy is how much of a non-issue this should be. The people looking to restrict your rights as dog breeders are actually just a small minority of the population. Their numbers are vastly overwhelmed by the number of homes with dogs. Yet that "animal loving" minority regularly gets laws passed that slowly erode your rights. How? Because they work hard to push their agenda while breeders would rather complain. Animal welfare advocates march on state capitols. They 'educate' the public on their views. They make sure that the publics image of a breeder is a puppy mill or the crazy lady with 40 dogs crammed in tight cages. In the meantime responsible breeders do little to combat this image, ignoring the huge pool of dog owning people who are pre-disposed to understand the dog breeder's viewpoint. So the next time you are tempted to go on a chat list and complain about some new law being passed, look around your kennel and your community and see what you can do to improve the image of the sport you enjoy. And don't miss what happens when Peta Makes War On Bikers Short and sweet, you'll love it!